The battle of 'Sitting Vs Standing' at work rages on this week. Whilst there is considerable evidence highlighting the dangers of extended periods of sitting, fresh research has exposed that standing up all day long isn’t the solution either. So what is the answer? 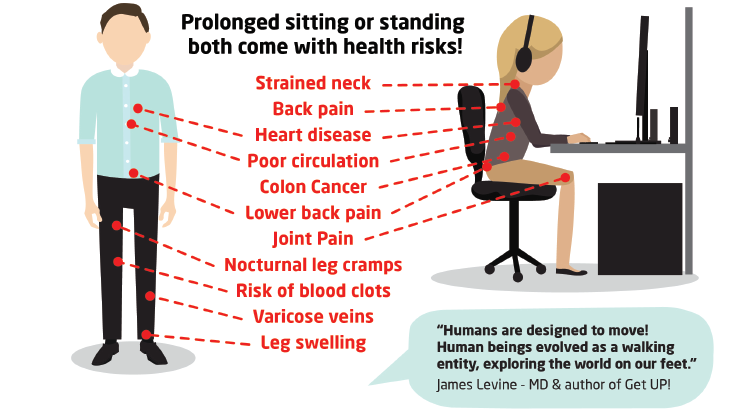 A 12 year study recently published in the American Journal of Epidemiology found that those who predominantly stand whilst at work were twice as likely as those who generally sit to develop heart disease during that period. 7,300 workers in Ontario, Canada, aged 35-74 took part in the study, chosen because they were heart disease free at the outset. A huge range of factors were taken into consideration, including general health, occupation, behaviours and working conditions. After identifying those who mainly sat and those who mainly stood at work, the research team then looked at health records to identify those who had developed heart disease over the course of the study. They concluded that the risk of heart disease was greater for those who stood at work (6.6%) than among those who sat (2.8%). Somewhat ironically, the study even concluded that the risk of heart disease among the standers was even slightly higher than among daily smokers (5.8 percent). So is standing, and not sitting, the new smoking? The short, and right answer, is an emphatic no. The health complications which arise from smoking (lung cancer, strokes, asthma, infertility, diabetes to name a few) are far more numerous than simply heart disease. The same can apply when comparing sitting vs standing. Heart disease isn’t the only health issue facing workers. Musculoskeletal disorders are the biggest health risks for those who predominantly sit whilst at work; along with a host of health issues which arise from sedentary behaviour. As highlighted in a previous blog post, the answer is movement. As the saying goes ‘variety is the spice of life’, and this applies too when it comes to our posture. Varying your position at regular intervals improves blood circulation, maintains your metabolism, keeps your muscles strong, and provides many more benefits to your body and mind. Just type “why is movement important” into google and you will find endless articles on the positive influence of keeping your body moving. The hard part is applying this knowledge in the workplace. 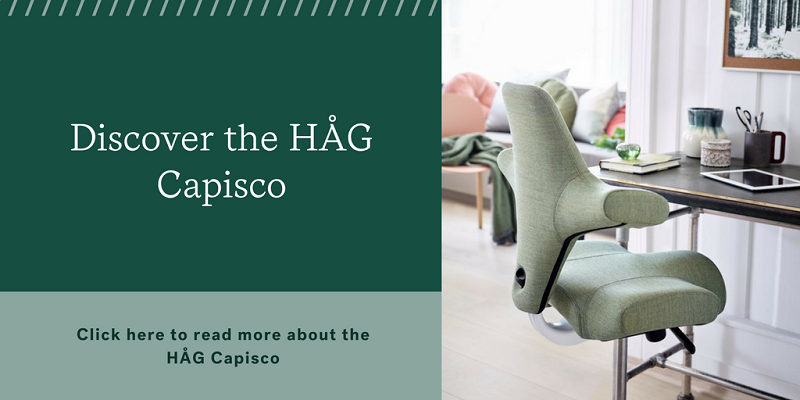 Peter Opsvik, the designer of the HÅG Capisco has a saying too, “the best position is the next position”, a philosophy which heavily influenced his design of the Capisco, and a central feature of active sitting. 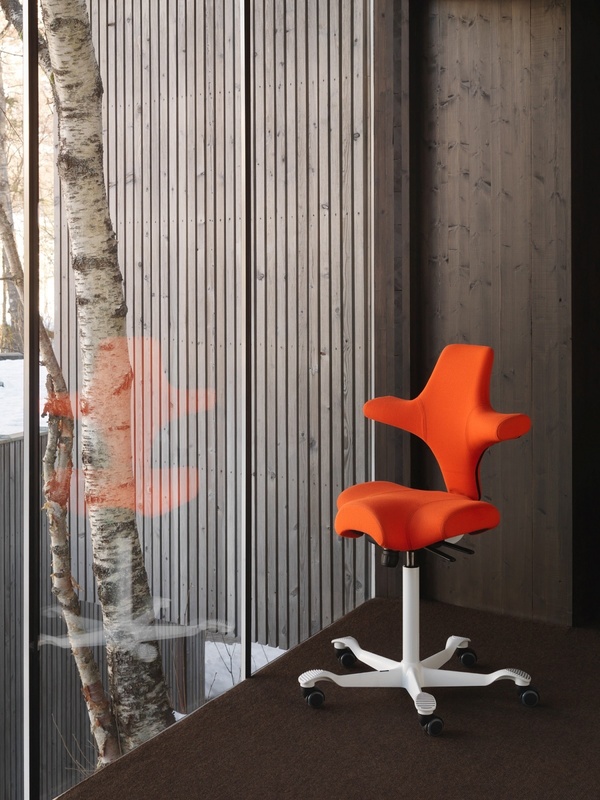 If your job doesn’t allow you to stand up, you need a chair which provides the greatest range of movement whilst seated. 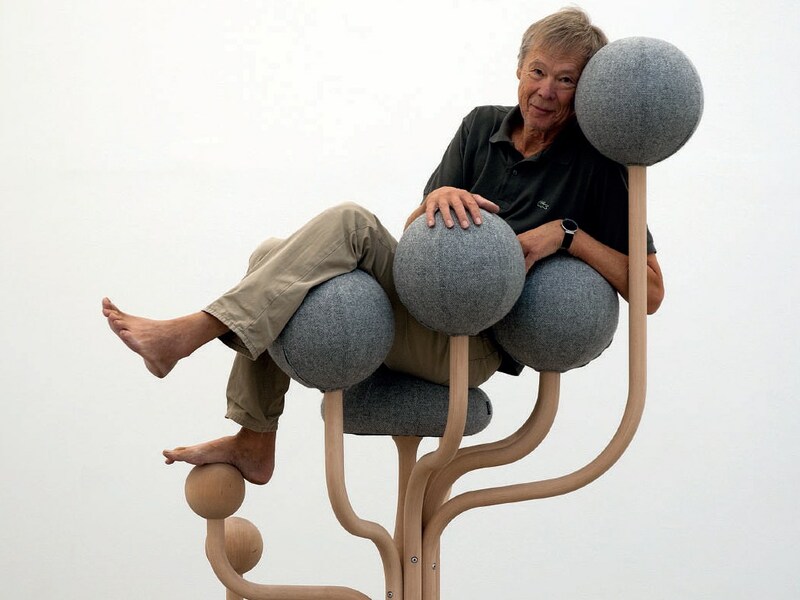 30 years ago Peter Opsvik designed the Globe Garden chair, which highlights the abundance of comfortable postures the human body can find for itself. The HÅG Capisco is one of the greatest ever chairs when it comes to encouraging movement, as highlighted by a recent review by Forbes, “From the second you sit in the HÅG Capisco, you want to spin around a bit, set your legs on the foot rest and spin that around or put one arm around the side of the back rest.” By providing a tool which not only allows, but encourages movement, you can safeguard against the negative effects of sedentary behaviour without radically altering the working environment. The major issue with prolonged sitting is the prolonged single posture, if you take that out of the equation, you are already on the right path. 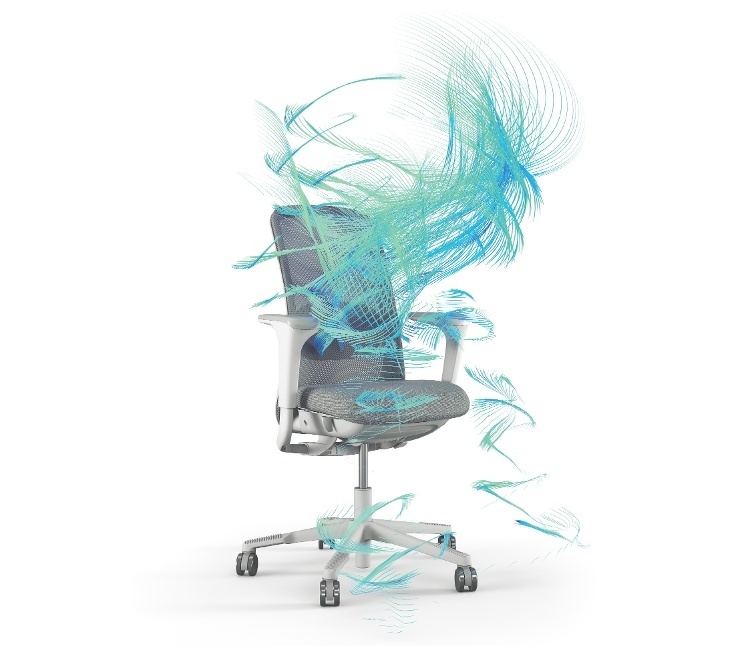 The HÅG SoFi mesh takes it one step further by actually enabling “light human activity” whilst seated. In an independent study conducted by the Karolinska Institutet, as many as 73% of the test subjects reached levels of movement classified as light human activity (i.e. 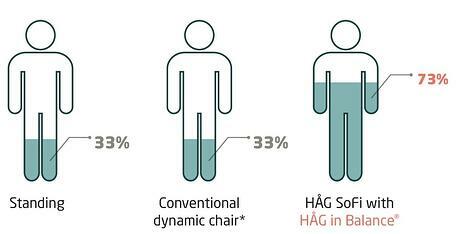 not sedentary) when sitting in a HÅG SoFi, outperforming a conventional dynamic chair significantly. Light human activity.... whilst seated. That's the equivalent of taking a slow walk, and more beneficial to the body than hours of sedentary behaviour.